My colleagues and I conducted a workshop with WaterTap to enable water technology companies to better approach their pricing strategies. Prior to the workshop, I had the opportunity to interview the CFO of one of Canada’s leading clean-tech software companies that is focussed on the water sector, James Griffiths of Aquatic Informatics. James was able to share with me his thoughts regarding pricing for one the their software brands WaterTrax. WaterTrax helps agencies and utilities monitor and manage their water and wastewater system data, helping to streamline water and wastewater compliance. Using technology driven data collection, data management and reporting, WaterTrax equips its clients to streamline their regulatory practices and ensures compliance. Their clients benefit from real-time data and analysis of their ability to meet quality water standards. WaterTrax was founded in 2001, as a application service provider - you could say that they were in the SaaS business before it was called SaaS. WaterTrax joined forces with Aquatic Informatics in July 2017. For pricing to reflect value, customers need to receive economic and emotional value from the offering. Strong pricing power requires elements of both. Values are role specific so consider which of your roles will be driven primarily by economics versus emotion and vice versa. 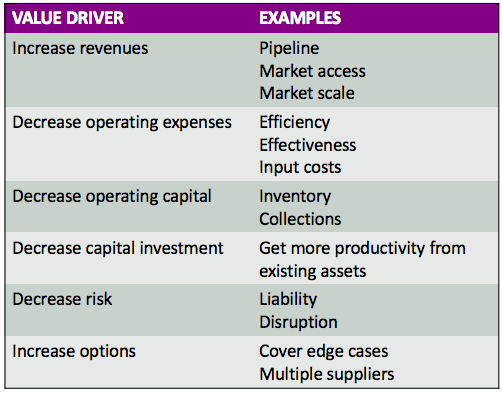 Here is a table outlining the six main economic value drivers and examples of each. Decreased Operating Expense: Time saved by technicians leads to improved efficiency of operations. WaterTrax provided customers with an ROI based on the amount of time saved by technicians through task automation, which would free up resources to concentrate on other tasks. Saving time is the key economic driver for their customers. Decreased Operating Expenses and Decreased Capital Investment through better planning and allocation of expenditures. With data and analysis, customers are able to better predict, and take action more quickly to avoid potential water quality issues. This enables the municipalities to determine budgets and how they should apply their capital expenditures and potentially reduce their overall operational expenditures. In WaterTrax’s experience, their buyers budget typically comes out of operating expenses (OPEX). Decreased Risk by mitigating against costly outcomes of poor water quality. “It is hard to put a figure on the value of reducing risk.” Insufficient water quality can impact the health of the entire ecosystem, not just human health. There can be dramatic environmental and social impact costs. For example, the Walkerton crisis that resulted in 2300 people falling ill and 6 fatalities, had an economic impact assessed at over $64.5M. A great framework for emotional value drivers is Maslow’s Hierarchy of Needs. The higher up the hierarchy that you are able to satisfy with your offering, the greater pricing power you can achieve. Emotional value tends to be role specific, so consider mapping the emotional driver that your offer creates for each role within your stakeholder map. Basic Functionality, Security and Community. Improved water quality to avoid tragedies like Walkerton. People expect to have clean water. Public service provides this vital service and plays an important role in the community. Self Realization. Municipalities and water technicians in particular take pride and ownership in knowing that they are keeping their communities safe. With better transparency and data being better managed and structured, information can be used to better inform the public that they serve. system that is based on the population served by the water system. The US EPA population bands reflect the budget and purchasing power of a water system and is therefore an appropriate metric to scale software subscription. At Ibbaka, we promote the need for pricing to be fair, transparent, and consistent. Utilizing an existing pricing metric that their customer is familiar with adds to increased transparency for WaterTrax. Furthermore, the tiered model based on this metric gives a degree of predictability on pricing that the municipality can model its investment on should its population fluctuate over time. As we consider attributes, we should always remember that it is the view of the customer and not our own views that matter. Affordability relates to both fairness and willingness to pay. Bear in mind that affordability is perceived differently depending on the specific segment you are targeting. Affordability factors into how you structure and fence both your offering and pricing tiers. Are we charging too little or too much? Is our pricing fair? Are we being to sensitive to budgets such that we are leaving money on the table? We are not alone when we ponder pricing. These are very common questions all companies ask themselves. You have to continue to test pricing. Pricing is not a once and done exercise. More often than not, pricing is not the objection to the sale. Pricing objections are typically a symptom of something else. For WaterTrax, the main criteria for securing the customer was to make their customers feel comfortable around the path to getting the WaterTrax system operationalized within their customer’s environment. I would be pleased to hear your comments on the key questions you ponder when it comes to setting your pricing strategy. In the meantime, I invite you to participate in our survey on pricing innovation where we explore how companies create and price their innovations. Older PostWho are you creating value for?